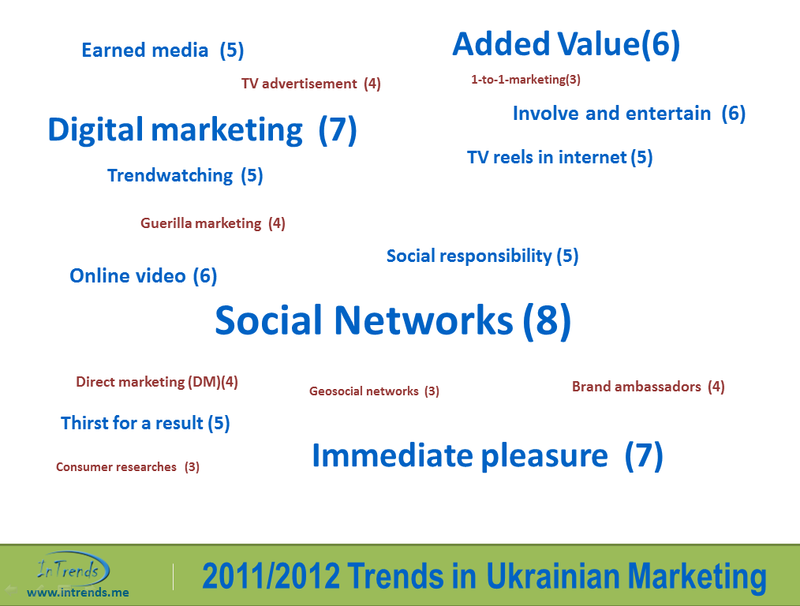 Ukraine 2011-2012: Trends in marketing and advertising without which we can not live : IRS Group Company. Market research consumers.CATI ReSearch, Mystery shopping. The speech of the agency InTrends at KIAF has become a tradition. The year 2011 was not an exception. On the opening day of the 12th KIAF at the workshop Marketing & Media Trends DAY the senior trendwatcher of agency Sergey Kuzmenko told about key trends in marketing and advertising. Many trends which have already won Ukrainian minds came from other countries and do not have Ukrainian origin. Every trend which starts spreading in our country obtains its own features and modifies accordingly. The ability to make out these features gives basis for making effective decisions. In order to understand how worldwide marketing and advertising trends are represented in Ukraine, the trendwatching agency InTrends addressed to the Ukrainian professionals. The marketing and advertising experts shared their opinions on current and future trends which will be taken into account in the development of the Ukrainian market in the nearest years.